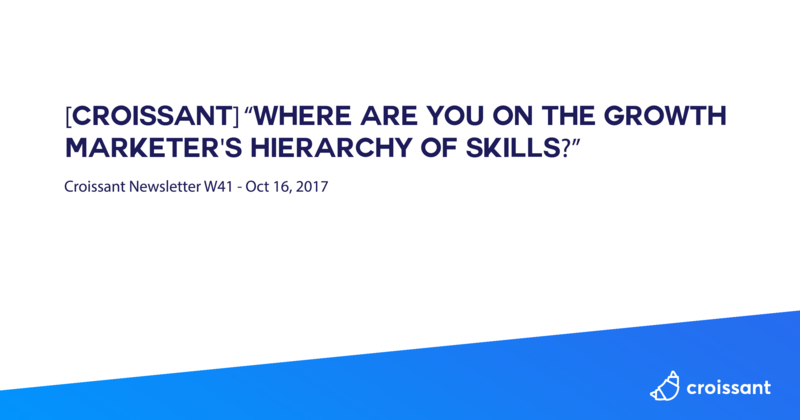 [Article] Where Are You on the Growth Marketer's Hierarchy of Skills? Foundational - If we lack customer empathy (foundational skill), or the ability to feel the pain our customers feel, we’ll struggle to build a product that solves a real problem. Product - If we don’t understand our users, and build a product that doesn’t solve a problem, we cannot achieve great retention (product skill) and our users will churn. Acquisition - If our users churn there is no point of thinking about SEO or content marketing (acquisition skill) because no one sticks around. Monetization - If we don’t have new users, or happy existing users, it’s pointless building a lead nurturing strategy (monetization skill) to upsell freemium users. We start at the base of the pyramid, then work our way toward the top.​"
"TaskRabbit correctly predicted that the confluence of these two forces would enable an entirely new form of “gig” labor, and that digital marketplaces to facilitate these exchanges would form a powerful new economy. Each gig was a discrete assignment from a single client, lasting only hours or even minutes. Workers could take as few or as many gigs as they wanted and were in total control of their own hours. Clients and workers did not know each other at the time of matching and quality was mediated via reviews and ratings rather than reputation or word of mouth. Supply and demand were matched via dynamic pricing that would fluctuate in real time. Given the multiple year head start it had against its competitors (see Table 1), the huge (for the time) amounts of VC cash it was able to raise and insane amounts of online buzz for its revolutionary new labor model, TaskRabbit started with a formidable first mover advantage." "At Hull, we love Clearbit. Many of our customers who sell B2B customers depend on Clearbit data to convert more leads and close more deals. By using Hull’s customer data platform, they can get all the data they need (including Clearbit data) into the tools that their teams want to use. Even if you’re not sure how a customer data platform works, here are ten simple reasons why it is better to use your Clearbit data through Hull. Reason #1: Orchestrate all your Clearbit data without code. Reason #2: No developer needed. Reason #3: We’ll setup your Clearbit data flows with you." "Some people say email is dead. That couldn’t be further from the truth. Here’s proof. Recently, I tweeted a video to my 57,300 followers on Twitter… 55 clicks. I was curious how email compared. So I sent an email to 60,251 subscribers with the same video… 3,600 clicks! In other words, email performed 6,445% better than Twitter. Email has been my #1 most profitable marketing channel for 10 years in a row. It’s one of the reasons we’ve grown Sumo + AppSumo to 8 figures. To learn new email marketing best practices, I met up with Gary Levitt . As the founder of Mad Mimi (an email marketing product acquired by GoDaddy), Gary knows how to create ultra-successful email campaigns. In this episode, you’ll learn epic email marketing best practices from Gary." "You walk into your growth interview after hours of preparation. You’ve perfected your 2 minute pitch, polished your work stories, and maybe even done some case prep. You’re ready to showcase your achievements and you have an answer ready for any question they throw at you. But there’s one big problem you’ve overlooked - the interview isn’t actually about you. Most candidates approach the interview process as a way to showcase themselves and their accomplishments. But, the best growth candidates orient the process around the company and its strategy. After years of interviewing hundreds of people applying for various growth roles, I’ve seen candidates make the same 6 mistakes over and over again. They all tie back to this one core error - thinking the interview is about you. In this post, I’ll outline the six most common ways those mistakes play out - and look at the mental models that can help you avoid falling into the most common trap that trips up even the strongest growth candidates." "Here’s a secret: Virality is overrated. Virality and large, interactive linkbait is shiny and fun to talk about but sustained quality content and links, done over and over again... is what drives sustainable business value. And you can do it yourself! For less. And you can learn from it without breaking the bank. How can you consistently create effective, linkable content? Here’s our playbook for doing it. First, make your business invest in at least one sunk cost differentiator. What are examples of sunk cost differentiators? A photographer. A videographer. An animator. Best-in-class website design. Industry-best graphic designers. If you can’t invest in any of these, stay home. Find top/middle funnel search topics that have 30 LRDs each on average and build those, first. In B2B spaces, make an effort to build data studies that get cited. And even if you do that, always curate the go-to “KEYWORD statistics” post, too. In B2C (or B2B), build the things people curate. Make sure they tie back to search and drive real business value. Slot that content in a folder, ideally one word that still signifies what it’s about. /blog/ or /reviews/best-air-conditioner/ Then, make your content exactly the highest volume version of the keyword, unless the folder repeats it /ideas/home-decor/. Do some targeted outreach. Rinse and repeat... forever." [Article] What Is Conversational Marketing? "After talking to thousands of customers, what we’ve heard loud and clear is that something is broken with the way we market and sell. We’ve become so focused on things like A/B testing, retargeting, email blasts, robocalls, form fills, marketing-qualified leads (MQLs), and sales-qualified leads (SQLs), that we’ve lost track of what really matters. By giving people the option to skip the form and have a one-to-one conversation, you’re helping to make personal again. And that’s what conversational marketing is all about."